Peter has made a number of recordings over the years as can be seen from the Recordings listings page and, indeed, he had a recording contract for a number of years. Although most feature him singing, Peter has also done some spoken recordings. In his own right he has recorded a single called Follow That Girl and two LPs, Songs Of The Sea and Peter Gilmore Sings Gently; a couple of tracks from Songs Of The Sea have also been released as singles in Europe. Released in 1960, Follow That Girl is a “pop” version of the title song from the musical Follow That Girl (see Theatre section). Personally, I prefer the original version on the cast LP but the B side of the single has a lovely ballad called Come Away, one of my favourite of Peter’s songs. 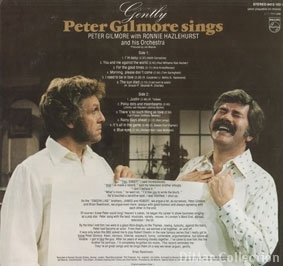 Peter’s rendition of Hushabye Mountain, from Chitty Chitty Bang Bang, is a particular favourite of mine, in fact, I prefer his to Michael Ball’s recent version in the London stage production. The LP was recorded in The Netherlands and Peter was also filmed in mid 1974 singing the songs for a Dutch TV special. “You, SING? !” I said incredulously. “And I’ve made a record,” said my television brother smugly. He’d touched a sensitive spot. I was mollified. I shut up. As “Onedin Line” brothers, James and Robert, we argue a lot; as ourselves, Peter Gilmore and Brian Rawlinson, we argue even more: always with good humour and always agreeing with each other in the end. Of course I knew Peter could sing! Heaven’s sakes, he began his career in show business singing - as a pop star. Peter sang with the best: musicals, variety, revues; in London’s West End, abroad, television - the lot. By the time I met him (we were in a fibre-glass dinghy on the Thames, rowing, typically, against the tide!) Peter had become an actor. From then on, we worked a lot together, on and off. It was only when the BBC asked me to play Robert Onedin in the now famous series that I really got to know Peter Gilmore. Keen, nervous, intense, wayward, funny, vulnerable, argumentative, but above all lovable - I got to like the guy. After six years of working closely together, I’ve come to love him like the brother he portrays. I’d completely forgotten his music. This record reminded me. They’re all great songs and he sings them (in a way we never argue) gently. As well as his solo efforts, Peter can be heard singing on a number of other records, mostly recorded in the late 1950s and early 1960s. In terms of musicals, he reprises his roles of Tom/Constable Blenkinsop on the original cast recording of Follow That Girl; as David Tooke on Valmouth (still available on CD in the USA); and finally as Captain Macheath in The Beggar’s Opera. The latter also features Peter’s second wife, Jan Waters. As well as singing the title track, Peter has a second solo on Follow That Girl - the lovely (sorry!) Lovely Meeting You At Last, and sings with other cast members on several more. The LP crops up now and again on eBay and is well worth purchasing. In addition, Peter sings on a few studio cast recordings of musicals he didn’t appear in on stage: Bye Bye Birdie, Salad Days/The Boyfriend and The Sound Of Music. On the latter he only has one song - Sixteen Going On Seventeen. On Bye Bye Birdie, which also features his Carry On compatriot Sid James, one of the songs performed by Peter is the well-known Put On A Happy Face; his duet on An English Teacher with Joyce Blair is a particularly fine recording. He has more duets on Salad Days/The Boyfriend, the best probably being another popular song, I Could Be Happy With You, recorded with Pamela Charles. Two further famous songs Peter has recorded are Mona Lisa and The Man From Laramie which are included on a compilation LP Music From The Movies. Peter also sings in the film Oh! What A Lovely War and he may be heard on the cast LP though we aren’t sure of this. The spoken word recordings include singing and reading in a 1963 recording of Much Ado About Nothing, starring Rex Harrison and Rachel Roberts. Similarly on Shakespeare/Soul Of An Age, Peter is heard in a couple of extracts from Shakespeare’s plays; Sir Michael Redgrave undertaking the main readings and Sir Ralph Richardson narrating. Shakespeare/Soul Of An Age was an NBC production which used the text from Shakespeare’s plays against a backdrop of locations where he lived or where his plays were set; it was released on both video and LP. Peter has recorded only one audio book that we are aware of. His reading of RD Blackmore’s Lorna Doone is extremely good and it is puzzling why he hasn’t done more. His most recent recording is as narrator on Carry On Doctor. The soundtracks from a few of the Carry Ons were released on audio tape in 1995 with a specially recorded narration overlaying the film’s audio track. Peter was also advertised as doing the audio commentary for the 2003 Special Edition DVD release of Carry On Henry but sadly ill-health prevented his participation. Peter also turns up on a few EPs, both singing and speaking, including some children’s stories. He is Rat on Toad Of Toad Hall, takes the part of Mouse on Thumbelina and plays the girls’ neighbour Laurie in Little Women*Little Men. A further EP he can be heard on is the musical Hooray for Daisy! (although he doesn’t feature on the original cast LP). To see the covers of some of these recordings, click here …..